Three teenagers have died at a St Patrick's day event in the Greenvale Hotel in Northern Ireland. PSNI Assistant Chief Constable Mark Hamilton said the victims were a 17-year-old girl, a 17-year-old boy and a 16-year-old boy. A 16-year-old girl is in a stable condition in hospital following the incident at the hotel in Cookstown, County Tyrone. A further two teenagers were treated for injuries. "Two of them died in hospital and one died at the scene," said Mr Hamilton. "It is heartbreaking that an event which should have been fun for these youngsters on St Patrick’s night should end in such a terrible tragedy. "Our investigation is at an early stage, and while the exact cause of the incident is still unknown, there are reports of a crush at the scene and initial enquiries indicate that a large group of young people were waiting to enter a disco. We also have reports of some fighting after the incident commenced and at least one person has reported that they were assaulted." he said. Mum Emma Heatherington, whose two teenage sons were at the disco, described how she felt physically sick when she heard the police appeal about the incident. "I don't think I'll ever experience a fear like it again. It was just horrendous," she told U105. 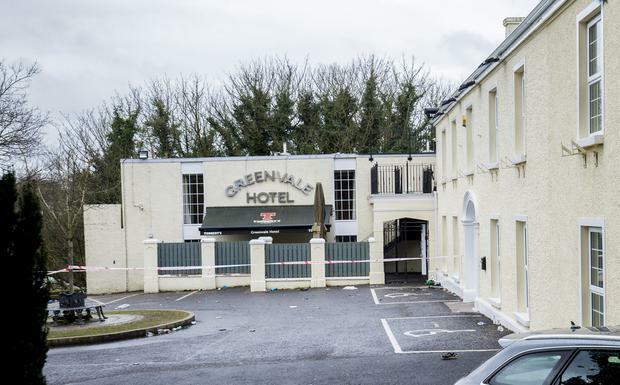 "I lifted my phone and saw that police had put out an appeal for parents to pick up their children from the Greenvale Hotel because their had been an incident. You can imagine the blow to my stomach when I saw it. "I rang my son immediately and he answered, thank god, and the two of them were okay." The Northern Ireland Ambulance Service received a 999 call at 9.30pm last night with reports of people injured outside the hotel. They declared it a major incident and police, Fire Service and Environmental Health then also attended the scene. Dr Nigel Ruddell, medical director of the Northern Ireland Ambulance Service, described the events as a "tragic accident". He said six emergency ambulances, four emergency response doctors and four emergency officers attended the scene after receiving the emergency call at 9.26pm. "At this stage everything points toward it being a tragic accident and our hearts absolutely go out to the families of those involved and everybody who was caught up in this incident last night," he said. Ulster Unionist Councillor Trevor Wilson said the Cookstown community is in a state of shock following the incident. “These young people were heading out to enjoy themselves and celebrate on St Patrick’s night and then this tragedy unfolds. It’s hard to take in what has happened," he said. “I spent most of the night at the scene and can say that the emergency services did everything they could to help those who were in distress. Young people and their parents have been traumatised and will need a lot of support in the coming days. "The Cookstown community is in a state of shock at what has happened but I know that they will rally round to provide whatever support they can." The Drum Road in Cookstown was closed off in the wake of the incident. DUP leader Arlene Foster said her "thoughts and prayers (are) with everyone impacted by this tonight". Sinn Fein Vice President Michelle O'Neill said what was supposed to be a day of celebration "ended in heartbreak and sadness for those involved". “My thoughts and prayers today are with the families and friends of those killed in this tragic incident," she said. “I also want to wish a speedy recovery to the young people injured and those who witnessed the incident, we will work to ensure they have the services and support necessary to deal with the trauma of this tragedy in the time ahead." Party leader Mary Lou McDonald said: “I cannot fathom the horror that the parents of these children are going through this morning. What should have been a night of fun and celebration for young people has turned into a night of tragedy. “I wish to extend my deepest sympathies and condolences to all the families affected at this time of heartbreak, shock and loss." SDLP MLA Patsy McGlone said: "I would encourage anyone with information or any footage from the event to contact the PSNI. However, I would ask that people do not share any footage online at this time. "This is truly every family's worst nightmare. My thoughts and prayers are with the deceased and their loved ones at this devastating time." Alliance MLA Kellie Armstrong described the news as "absolutely heartbreaking". "As the mother of a teenager the same age, I can’t even begin to imagine the pain and suffering they must be going through. I hope support is also given to their friends and anyone who was at the event," she added. "While any investigation into this tragedy will be at an early stage, with the reports of a crush, I would hope the Health and Safety Executive would be involved to consider if crowd control and access to and from the venue was properly managed." Northern Ireland Secretary Karen Bradley said her thoughts and prayers are with the families of the victims. "I have spoken this morning to ACC Mark Hamilton, of the PSNI, who is leading the investigation alongside the Health and Safety Executive, and I asked to be kept updated," she added.